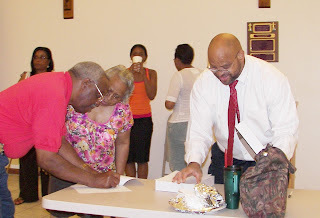 encourages Charles Sanders and Ann Lacy to sign a smoke-free pledge card at a coalition event. The Mississippi County Coalition for a Tobacco Free Arkansas assisted citizens as they pledged to educate friends and family about the danger and harmful effects of tobacco, in addition to vowing to lead a smoke-free/tobacco-free life. For information on quitting tobacco, call the Arkansas Tobacco Quitline at 1-800-QUIT-NOW. Carolyn Yarbrough, coordinator of the Tobacco Awareness. Sparks flew as the Evergreen Church family unveiled sixty promotional, “I Am Super Woman 1-800-QUIT-NOW” t-shirts during the 12th Annual Super Woman’s Super Conference, July 29-August 1, 2010. More than twenty-five churches gathered from Arkansas, Texas, Mississippi and Louisiana for four days of celebration and information. Participants received minority disparity facts from The Tobacco Awareness Program “TAP”, gift bags and 1-800-QUIT-NOW church fans at this year’s summit. For more information on minority disparities, call Eddie or Carolyn Yarbrough 870-918-7264, see TAP’s Quarterly Newsletter, or email your request to evergreen1510@earthlink.net. 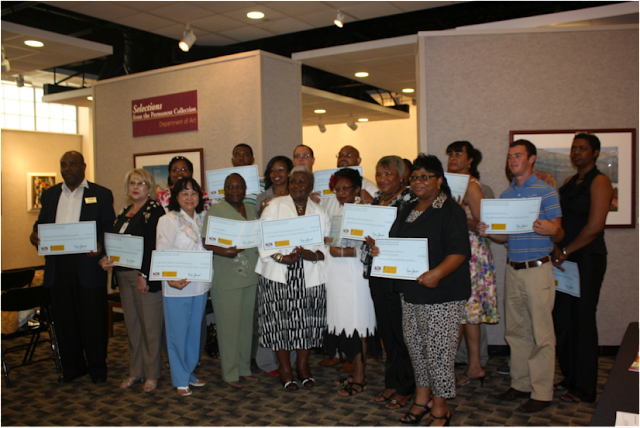 The Minority Initiative Sub-Recipient Grant Office at the University of Arkansas at Pine Bluff recently funded eighteen (18) organizations for the 2010-2011 year. These organizations, located throughout the state of Arkansas, submitted excellent proposals that combined with strong coalitions and activities will attempt to combat tobacco use and exposure in minority communities. “The Minority Initiative Sub-Recipient Grant Office feels that McCastle’s experience and enthusiasm will bring a new and innovative approach to the tobacco prevention message,” says Dr. Marian Evans, MISRGO Program Coordinator. “We are excited about the possibilities for the Addiction Studies Program with Ms. McCastle on board,” says Dr. Jerry Lewis, Director of the Addiction Studies Program. McCastle, a proud east Texas native, transferred to UAPB from The University of North Texas in 1992. She completed her undergraduate studies at Philander Smith College, earning a Bachelor of Arts degree in Philosophy and Religion. She adopted the stage moniker, “Toni Seville” and went on to devote herself to seventeen years of tirelessness in the field of communications, television and radio combined. The near twenty-year stretch afforded her the opportunity to work alongside entertainment industry greats and philanthropists such as Tyler Perry, Vanessa Williams, Steve Harvey, Russell Simmons, and former President Bill Clinton. For more than ten years, Ms. McCastle has repeatedly accepted Jefferson County’s “Community Call” of duty from on-campus arms like SGA, Communications Day, John Graham and M4, to name a few. She recently took an interest in assisting families and children affected by incarceration as advocate and mentor in the Jefferson County Circuit Court Sixth Division Youth Advocate Program. In November of 2009, McCastle founded a non-profit, 501c3, housed in the UAPB Business Incubator. Her community service persists as an active member of Alpha Kappa Alpha Sorority, Incorporated, Delta Omega Omega Chapter. BLYTHEVILLE, AR (KAIT) – One Region Eight town wants to stamp out tobacco use in its public parks. Restrictions on smoking have long been in place across the state. A potential ban in Mississippi County includes not only cigarettes but all tobacco products. “There are cigarette butts here and some over there,” said parent Jessica Jernigan. Walker Park in Blytheville is one example of a park in the city that has a smoking problem. At their council meeting on Tuesday night, the city of Blytheville will have the third reading of an ordinance banning tobacco products from city parks. “It’s a family place to bring your kids and to play,” said Jernigan. Jessica Jernigan is a pregnant mother of two who likes to bring her son, JJ, to the park but worries about what she sees. “It’s ridiculous how many cigarettes you will find in a kid’s park where the kids play,” said Jernigan. Elroy Brown, who heads the Mississippi County Coalition for a Tobacco Free Arkansas, lost two family members to tobacco use and is a strong believer in limiting the use of the products in public areas. “If I’m sitting there with my kids or a child or my grandchildren, they’re smoking too by breathing in all these chemicals,” said Brown. Brown wants people to know how dangerous tobacco products can be and is proud to see the city taking this step in what he calls the right direction. “By making the park smoke free it will cut down on the litter you have tobacco cigarette packages out there you can see cigarette butts out there,” said Brown. While we were in the park, there were two women smoking who declined to be on camera and left right after we arrived. One of the three playgrounds at Walker Park is where they were smoking and parents say that sends the wrong message to their children. “He sees it on the ground and he sees everybody smoking and he thinks it is ok and he’s at the age of two,” said Jernigan. If passed, the tobacco ban would include all four Blytheville city parks. On the first offense, you will be warned. On the second offense, you will be banned from the park for ten days and pay a fine of $25.